Media Contact: Dale Grover, dgrover@redcedar.com (734-417-8677). Developers, artists, and enthusiasts come together for one day to display their ideas, projects, and inventions at the seventh annual Ann Arbor Mini Maker Faire, June 6, in Ann Arbor, Michigan. Applications are sought from people and groups with engaging, cool projects. Organized by members of the Ann Arbor tech and arts communities such as a2geeks (http://www.a2geeks.com) and GO-Tech (http://tech.groups.yahoo.com/group/notbago/), the Ann Arbor Mini Maker Faire is a small, local version of the huge Bay-area Maker Faire, the fair that brings together science, art, craft and engineering plus music in a fun, energized, and exciting public forum. We aim to inspire people of all ages to roll up their sleeves and become makers. This family-friendly event showcases the amazing work of all kinds of makers–anyone who is embracing the Do It Yourself philosophy and wants to share their accomplishments with an appreciative audience. If you have any questions about participating in Mini Maker Faire, please visit us at http://www.a2makerfaire.com. Local and regional Makers will show off their creations at the fourth Ann Arbor Mini Maker Faire (http://www.a2makerfaire.com), held 10 am to 5 pm Saturday June 2, 2012. This family-friendly event is free to attend, and is again at the Washtenaw Farm Council Grounds (aka “Saline Fairgrounds”) 10 minutes south of Ann Arbor. Past Faires have featured silkscreening, vortex cannon, robots, amateur radio, sustainable technology, learn to solder, DIY satellite, computerized jukebox, machine vision, giant Simon game, make your own comics, and more, all with an emphasis on “do it yourself”. The mission of the Ann Arbor Mini Maker Faire is to present interesting or unique exhibits, individuals, and demonstrations in DIY science, technology, engineering, and art that excite, motivate, and educate. The emphasis is on cool things, skills, and knowledge. As a shorthand, the exhibits are the kind of thing you’d see in Make Magazine. The Faire is organized by a2geeks (http://www.a2geeks.org), a new Ann Arbor area foundation promoting the informal technology culture, and is organized in cooperation with Maker Faire. Organizers of the Ann Arbor “Mini” Maker Faire have issued a Call for Makers for the June 2, 2012 event to be held at the Washtenaw Farm Council Grounds. The Faire features exhibits and activities in robots, green tech, science, radio, rocketry, unusual tools/techniques, fixing and/or taking things apart, and other areas, all with an emphasis on “do it yourself.” Last year’s Faire drew over 1,400 people to engage in activities such as learning to solder and silk screening t-shirts, and saw exhibits including some which were featured in Make Magazine. The Faire is free to exhibitors and visitors alike, and is funded by sponsors. It is organized by the group a2 geeks (http://www.a2geeks.org), a newly organized Ann Arbor area non-profit foundation promoting the informal technology culture. The Faire is a local version of the major Maker Faires in the Bay area, at the Henry Ford Museum in Detroit, and in New York City. Exhibitors can find additional information and an online application form at http://www.a2makerfaire.com. Application deadline is May 13, 2012. The mission of the Ann Arbor Mini Maker Faire is to present interesting or unique exhibits, individuals, and demonstrations in DIY science, technology, engineering, and art that excite, motivate, and educate. The emphasis should be on cool things, skills, and knowledge. As a shorthand, the exhibits should be the kind of thing you’d see in Make Magazine. 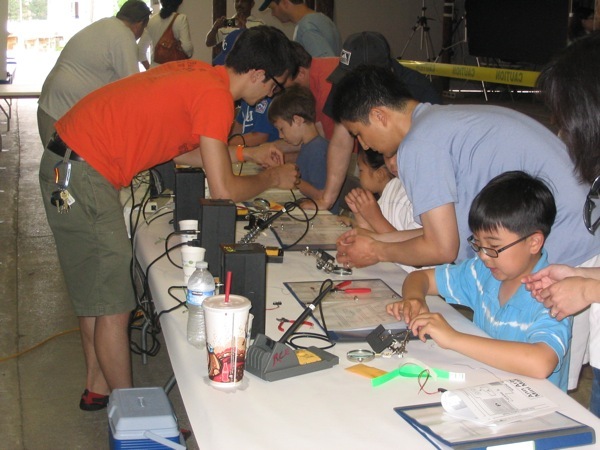 Caption: Visitors to the Ann Arbor Mini Maker Faire learn to solder a simple circuit.